What is Knockout and Why Knockout? To understand it better, let’s take a look at the below picture from their tutorial (click on it to see it in full screen). After step #3, Knockout will take care of updating views when model data changes and updating the models when there is change in the views without us having to do all those things. That’s the gist but for more please go through their excellent tutorials here. Mobile pack for Knockout is essentially a set of example ‘Contacts’ apps that shows how to use our Mobile SDK and KnockoutJS framework and easily talk to Salesforce backend. They are ‘single-page’ apps but with multiple views (list view, details view and edit view). They use Twitter Bootstrap as a UI framework and come in various versions depending on deployment and code locations (Heroku, Visualforce and Cordova-Hybrid). To understand where KnockoutJS, Twitter Bootstrap etc fits in, let’s take a look at the overall architecture. 1. A mobile web app that runs in the browser. 2. A hybrid app using Mobile Packs (this is excluding pure-native Mobile SDKs). 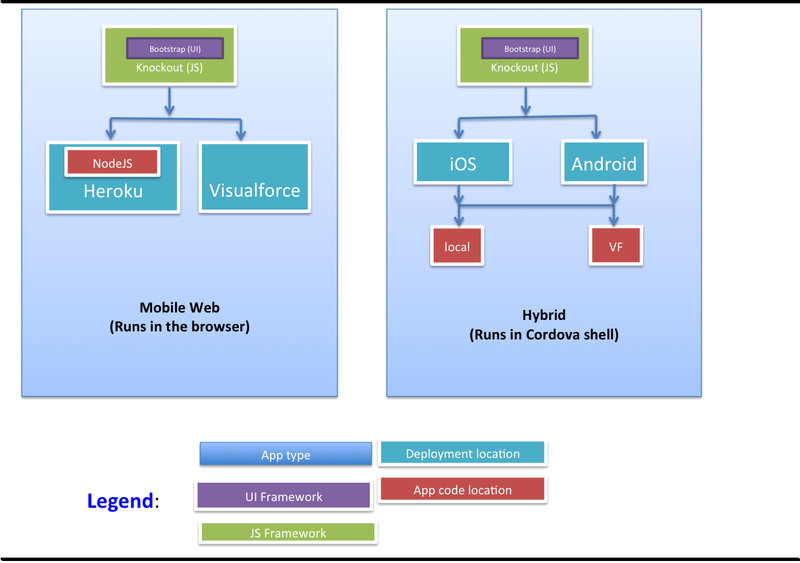 2.2 Android cordova hybrid app with files served from Visualforce. smartsync.js – A library thats a wrapper to mobilesdk.forcetk.js and helps sync data between app and Salesforce. mobilesdk.forcetk.js – A popular Salesforce REST api library that actually does the AJAX calls to Salesforce. cordova.force.js (Hybrid only) – A Cordova extension to help with OAuth and Salesforce smart-store. forcetk.ui.js (mobile web only) — An authentication library that helps with OAuth, login and logout of mobile-web apps. app.js – Main app where all the main app business logics and ViewModels reside. Before we go ahead let’s remember that our example Contacts app (Mobile Web – Heroku Bootrtrap Node.js) is designed as a ‘single-page’ app. This means once the app’s index page is loaded, it’s never reloaded but instead different ‘views’ (list view, details view etc) are simply added and removed to existing DOM by simply changing hash or anchor part of the url. 3. And finally, reapply Knockout binding after a new-view is injected (so that Knockout now works for this new view). //This is required to essentially wait until new view is swapped before applying bindings. * Create a Contact "CLASS" from KnockoutForceObjectFactory by setting SOQL parameters. Now that you are familiar with the architecture and various parts of the app, let’s take a quick look at the work-flow to understand how it all comes together. Step 2: Index.html page is rendered (in Cordova version, then native Salesforce OAuth is displayed). Step 3: Once the user signs in using OAuth, after the callback, it ultimately calls ‘initApp’ function in init.js. This simply initializes everything with real Salesforce user’s authentication information and redirects to ‘/contacts’ route. Step 6: By this step, the view is already changed to ‘list’ view and all the bindings are applied. But if you take a look at the ContactListViewModel, you will see that the minute it became ‘current’ viewModel (due to step 4), it makes an AJAX call to Salesforce to get list of contacts. And once those Contacts are returned by the server, Knockout will do its magic of automatically updating the views. Step 7: After this point steps 2 through 6 is repeated with different ViewModels and routes for other views and user actions. If you have read till this point hopefully you have gotten an understanding of how to build Knockout based single-page mobile apps. Now if you haven’t already, I highly encourage you to go through Knockout’s tutorials and take a look at source code for other variations (3 of them) in Knockout Mobile Pack samples github repo.